The CryptoMedia Security Platform is a complete content storage solution and includes a hardware root-of-trust, player software and trusted key provisioning services to meet the growing demand for high-quality digital movie watching experiences of 4K Ultra-high Definition (UHD) and High Dynamic Range (HDR) content. With support for VIDITY-based formats, CryptoMedia solutions deliver a secure digital ownership experience of premium content across multiple devices, including smartphones, tablets, smartTVs and home storage devices. 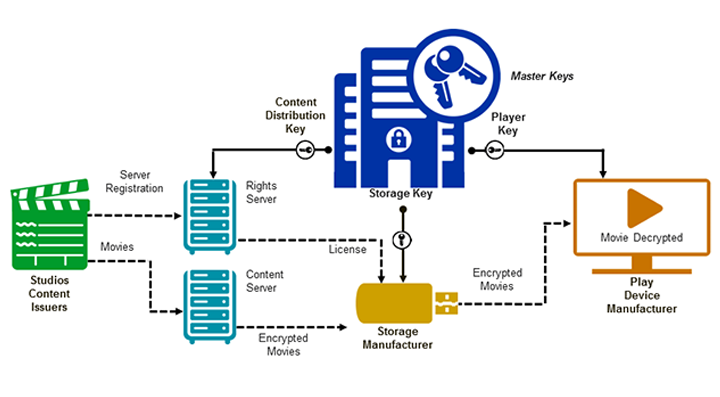 With a comprehensive suite of components for the entire content protection ecosystem, the platform is ready for the latest industry security requirements and enables VIDITY-compliant chipset makers, as well as storage and player device manufacturers to bring their products to market faster and easier. Robust security is delivered at the hardware and software level with support for content protection specifications and standards including VIDITY and MovieLabs ECP.